Beyond having made arguably the best catch in Citi Field’s short history, Pirates outfielder Travis Snider frequently tweets his meals under the awesome handle @lunchboxhero45. 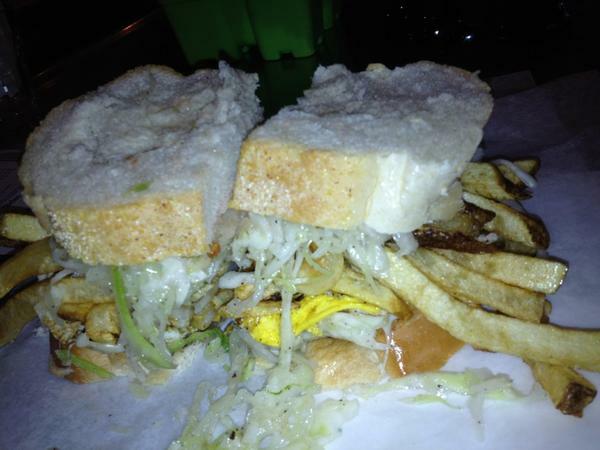 I’m not sure how I missed this, but Snider recently live-tweeted a trip to Primanti Brothers, the Pittsburgh-area sandwich establishment famous for piling french fries and cole slaw on their sandwiches. NotGraphs has the full story. Aside from how much I appreciate Major League Baseball players sharing their awesome sandwich adventures with fans, Snider’s experience gives us all something to strive for. He presents his trip to the Pittsburgh landmark, if a bit tongue-in-cheekily, as a means of thanking Pirates fans for their support in his first season with the club. And it sort of rings true: What better way to show a city your gratitude than by dining with its people at one of its most popular local haunts? This entry was posted in Baseball, Other Baseball, Sandwiches, Words by Ted Berg. Bookmark the permalink.